MKF-12PK Asymmetry voltage relay has two pairs of change-over switches, galvanically separated, with load capacity 8A 250V AC. It is designed to secure three-phase Motors (3 x 400 V AC) from the effects of working during circuit break in one of the supply wires (phase failure), at voltage drop (phase voltage asymmetry), and at incorrect phase sequences. The principle of operation is based on the measurement of the symmetrical component of the zero voltage. In case of loss of one phase or reduction of the voltage to about 175 V for longer than 3.5 s, the MKF-12PK relay disconnects the motor. After the cessation of the cause of tripping, the motor automatically re-starts. 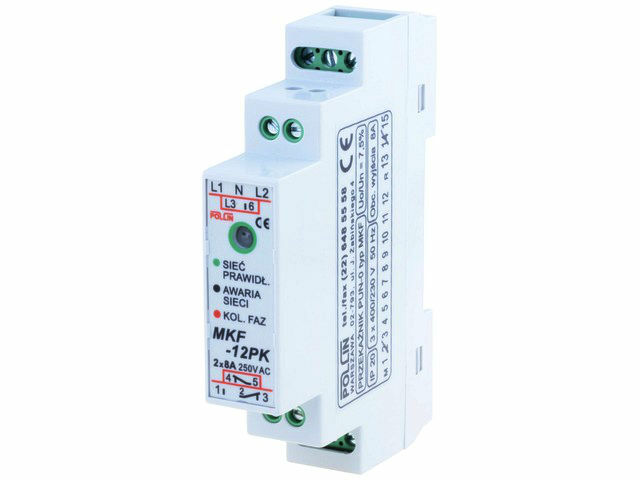 In case of incorrect phase sequence, MKF-12PK relay immediately switches off the motor. Phase sequence control takes place on the part of the three-phase network. Relay operation is indicated by LED diodes that shine green when the network is correct. Disappearance of the LED lights indicate the lack of at least one phase or phase voltage below 175 V. A change in the colour of the diodes to red indicates an incorrect sequence of phases.